The nursery I visited recently in Wilton, NH had a nice variety of hydrangeas ready to buy. With the exception of the tree variety hydrangea, all were together under a greenhouse dome and there were many to choose from the first of this week. 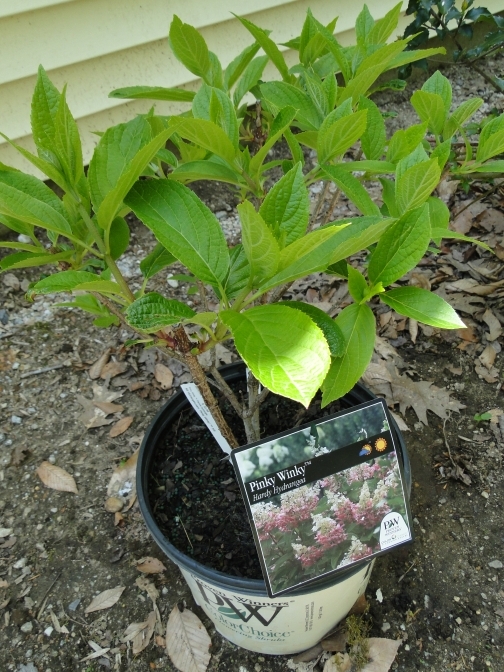 I couldn’t resist getting this Pinky Winky hydrangea (Paniculata) and I sure hope it likes living in my yard. The flowers will be elongated, white- changing to pink, according to the photo on the big tag. I haven’t had time to get it into the ground yet because we have been getting some nice rain. Also I am not sure exactly where to put it. This is my first Spring in my new place so I have been watching the sun – on the days it cooperates – to see which areas get the most. I think that this one will like some sun but to be shaded from the heat of the day so the front (east-facing) area should work. Also it will grow to be quite large so it will fill in the front bare spots nicely. I need to order some garden dirt for the entire front garden area, since most of the topsoil has eroded away it seems. I think they can grow into pretty large shrubs eventually. Good luck! I can’t wait for some blooms. I too can hardly wait. Good luck with yours.